Normally when the top drivers are forced to start in the back of the field many times they come back to win. Kyle Busch did it at Richmond in 2018; Matt Kenseth famously came from the back of the field to win the Daytona 500 in a backup car in 2009. Saturday a total of 8 cars failed pre-race inspection prior to the Monster Energy NASCAR Cup Toyota Owners 400. Several were top drivers including Denny Hamlin, Chase Elliott, Jimmie Johnson, Daniel Suarez, Eric Jones and Aric Almirola. There would be no dramatic comeback stories Saturday night, however. Johnson, Suarez and Jones did spend part of the race inside the top 10. None though were able to finish there. Johnson finished 12th; Jones 14th, Elliott 15th, Suarez 18th and Almirola 23rd. The only driver to break into the top 10 and stay there was Denny Hamlin. 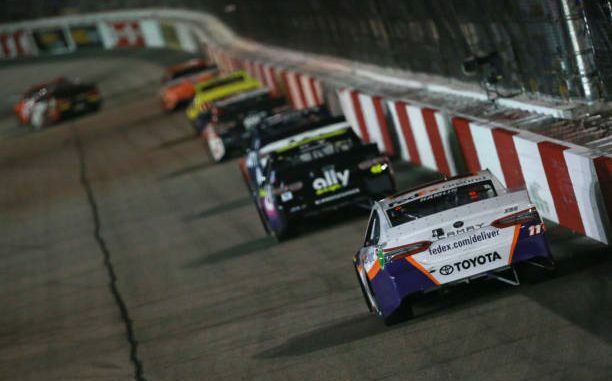 Hamlin fought his way forward and was fifth with 15 laps to go. That’s where he stayed for his 8th top 10 of the season.